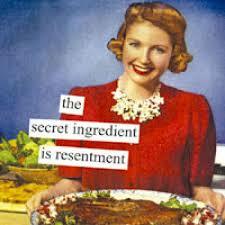 Resentment is like that chocolate cake that you can’t stop eating. When you feel resentful, do you feel disappointed in yourself? Feel as if you are a bad or selfish person? If you feel any of these things, know that you are not alone. Resentment is that feeling you have when you are doing something that you just don’t want to do or that you feel unappreciated doing. What makes resentment even worse is that we are not supposed to feel it. To make matters even worse, resentment is married to its evil mentor called ‘the need to please’. Do you find it difficult to say ‘no’? Do you feel as if you are obligated to do whatever is asked of you? (Not illegal things, just favors!) The need to please is the perfect precursor to a life of resentment. Will you pick up the kids? Yes. Will you take care of the kids while I’m at work? Yes. Will you have dinner ready? Yes. Can you help the kids with their homework? Yes. Will you agree with me that the ex is a bad mom? Yes. Oh! AND BY THE WAY….You have no say in the raising of the children. Okay. Your income is included in calculating child support. Okay. The children have to come first, then my job and then you. Okay. I really don’t want to discipline the kids when they are with us because I am afraid they won’t want to visit. Okay. I don’t love the kids. I think only of myself and/or my kids. I fear that he/she will leave me and I will be alone the rest of my life. I will be a failure. CONCLUSION: I AM NOT WORTHY TO SPEAK MY TRUTH. I HAVE TO DO WHATEVER IS ASKED OF ME. WHATEVER I NEED IS JUST NOT IMPORTANT. I AM TRAPPED. Is that true? Doesn’t it always come down to a feeling of lower worth? Perhaps, that complicated feeling of resentment comes down to one simple perception: our own value. I know it sounds like a cliché. If you don’t love and respect yourself, no one else will. Love and respect does not come from saying yes, yes, yes. It comes from pure honest answers that comes from your pure honest self. If this blog resonates with you and you want to change your circumstances, start with an honest conversation. Once you are clear with what you want and what you are happy to do, express your thoughts to your partner. Make an appointment to talk. Pick a quiet, calm time. Be sure to explain the ‘why’ behind your decisions in a fact-based way. Here is an example. It is scary and, yet, you will find that being honest will free you. Yes. Free at last! Free at last!